The long-neglected downtown area of Las Vegas is making a comeback. Shedding its recent reputation for having fallen into disrepair, this area is shrugging off the years that developers spent concentrating on the more accessible Strip. But with the recent opening of hotel-casino Downtown Grand, at the site of the old Lady Luck casino, a much-needed dose of luxury has been injected into the area, which has adopted the new name: Downtown3rd. New boutiques and restaurants are opening up at the Fremont East Entertainment District. And at Container Park, shipping containers are soon to be reincarnated as shops, bars, and restaurants. Even with all this new development, and an emphasis on hip, upscale digs, downtown is still affordable. Here's a few ideas how to have a luxury experience on a modest budget. December rates at the 634-room Downtown Grand start at $34 a night. You will also have to pay the mandatory $11 resort fee, but it does cover WiFi, two bottles of water per day, morning coffee, and the "Grand Experience" coupon book good for savings throughout the city. The property opened at the end of October, and will eventually have a rooftop pool and bar with private cabanas. An even cheaper option is Fremont East's El Cortez Hotel and Casino, the longest-running casino in downtown Vegas. Rates here start at $22 a night – with no resort fee! The Downtown Grand has 12 restaurants, many of which are outside of the building, along 3rd Street. This is a major departure from the philosophy at hotels on the Strip, which try to keep guests indoors at all times. The Triple George Grill (mains start at $15) focuses on steak and seafood, while Pizza Rock offers gourmet pizzas – from classic Italian to Chicago "cracker-thin" – starting at $11. On Fremont Street, at Park on Fremont you can dine at antique tables indoors, our outside in the restaurant's garden. The menu includes fried-chicken-and-waffle sandwiches and Cali-Mex burgers, and the restaurant runs regular specials, such as Taco Tuesdays ($2 carne asada tacos and $1 Coronitas) and Monday through Thursday happy hours with plates starting at $1. The essence of Downtown Las Vegas is perfectly encapsulated by the following trifecta of museums: the Neon Museum, the Burlesque Hall of Fame museum, and the Mob Museum. 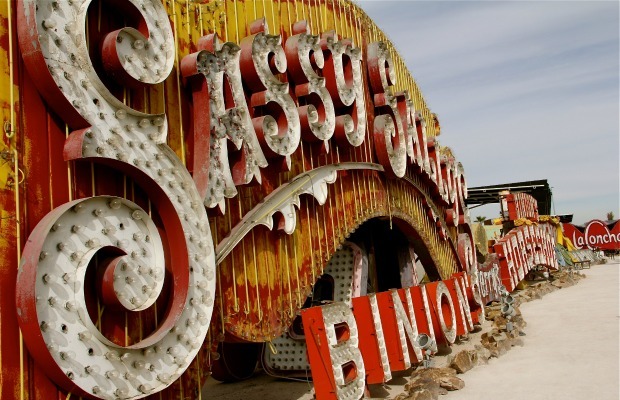 At the Neon Museum ($18), you can take an hour-long guided tour through the Neon Boneyard, a kind of resting place for vintage neon signs that have long gone dark and are awaiting restoration. The Burlesque Hall of Fame (free) is a small space that holds trinkets and costumes from the old days of burlesque. The souvenir counter is often staffed by one of the era's legends, happy to recount tales from the good old days. At the Mob Museum ($20), exhibits illustrate the history of organized crime from the point of view of both sides – the mobsters and the police. It's not open yet, but when it is, The Modern Contemporary Art Museum will house 35,000 square feet of museum galleries, spanning three floors, showcasing the works of both established and emerging artists from the 20th century onward. the museum's Luminous Park sculpture garden will feature interactive exhibits, walking paths, and community gathering spaces, providing a much-needed green space in Las Vegas’s downtown.